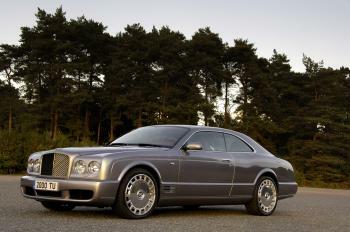 The Bentley Brooklands is a stunning new model that marks the company’s return to the luxury coupé market and reaffirms its reputation as builder of the world’s most exclusive coupés. It is the ultimate Bentley: a stylish, four-seat, grand touring coupe with classic British proportions and muscular performance. Sporting design cues are matched by the phenomenal performance engineering of Bentley’s legendary Crewe-built V8 engine. The new Bentley Brooklands possesses the most powerful V8 the company has ever produced – a 530bhp, twin-turbocharged 6.75-litre unit that also produces a massive 1,050 Nm of torque. Each Brooklands coupé will be hand-assembled, employing traditional coach-building techniques and the craftsmanship skills in wood veneer and leather hide for which Bentley is renowned. To ensure exclusivity, lifetime production will be strictly limited to just 550 cars, with deliveries expected to start in the first half of 2008. While the new Brooklands is influenced by Bentley’s fine coupé lineage, its design and engineering are thoroughly contemporary. The proportions of long bonnet, short front overhang and long rear overhang achieve the design objective perfectly, while the low roofline, steeply raked screens and pillarless side glass convey both power and movement. 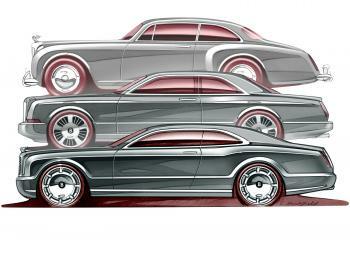 The ‘floating’ rear screen, for example, is a contemporary take on traditional coachbuilt Bentleys. The lower edge of the screen sits well above the upper edge of the boot lid to provide a flowing, flawless line to the back of the car. This can only be achieved by individually hand-welding the rear wings to the C-pillars. The fitment of 20-inch diameter wheels as standard, signalling the surefooted, robust and dynamic character of the new model, reaffirms the powerful stance of the new Bentley coupé. As in every Bentley, peerless craftsmanship is to the fore, enhanced by the warmth and richness of the finest natural materials. To tailor for their individual requirements, customers may choose from an extensive palette of hides, veneers, carpet tones and seat belt colours. Its four-seat architecture and deeply bolstered seats lend the Brooklands’ interior a distinctly sporting atmosphere, complemented by design accents such as aluminium foot pedals and footrest. A new, single-piece, hide-trimmed roof lining flows uninterrupted from the front windscreen all the way to the rear of the car, mirroring the long, sleek profile of the elegant exterior. The interior designers sought to offer the very highest levels of comfort and legroom, in true Bentley grand touring tradition, while the pillarless window design enhances the feeling of space. The Brooklands’ cabin is wider both front and rear than the previous Bentley Continental R coupé – the rear by 10 percent – and it easily exceeds the interior leg, knee and headroom of any luxury coupe on sale today. This allows four adults to be accommodated in supreme comfort. Individual rear seats with electrically operated sliding cushions, set further back than on the Azure, are separated by a new centre console, incorporating both storage and cup holders. Beneath its muscular, rakish, coach-built body lies the most powerful Crewe-built V8 engine ever produced, developing 530bhp. Maximum torque is an astonishing 1,050 Nm, the highest ever developed by a production V8 engine. Although performance figures are subject to final confirmation as part of the on-going development programme, the new Bentley coupé will deliver supercar levels of in-gear acceleration combined with Arnage refinement. Launched in the Bentley S2 saloon in 1959 with a capacity of 6.23 litres, the legendary, Crewe-built V8 engine has continually evolved. The first V8 was very advanced for its time with an all-aluminium construction, a five-bearing crankshaft and a well-supported camshaft, producing nearly 200 bhp and 400 Nm of torque. The result was a light and supple powertrain that produced maximum torque at low engine speeds, the hallmark of every Bentley ever produced. In 1969, the capacity grow to 6.75 litres, where it remains to this day, but by far the most significant change came in 1982, with the introduction of a turbocharger to provide the near-300 bhp Mulsanne Turbo, a car that transformed the image of Bentley. In 1999, the single turbo engine, by now featuring port injection and charge cooling, was installed in Arnage, with twin turbos arriving in 2002, developing up to 450 bhp. 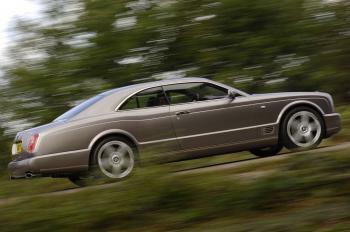 For the 2007 model Arnage, the V8 engine saw a step-change in performance and refinement which became the starting point for the new Bentley Brooklands. A re-profiled camshaft and new, low-inertia turbochargers, which operate with greater efficiency at lower engine speeds have resulted in reduced turbo lag, enhancing that wave of torque at any revs, the hallmark of a true Bentley. These changes extend the power potential of the V8 in the Arnage to 500 bhp and 1,000 Nm of torque. For the Bentley Brooklands, further component optimisation and engine calibration ensure record power and torque levels from this hand-assembled engine. As with the latest Arnage, the V8 engine is mated to a six-speed transmission with strengthened casing that transforms the way in which both parts of the drive train communicate. A sophisticated, locking torque converter and ESP system ensure that the driver can readily access the prodigious power. A semi-automatic function allows manual gear selection for even greater driver control. *The challenging Brooklands banked racetrack, which this year celebrates its centenary, was the birthplace of British motor racing. During the 1920s and early thirties, Brooklands, located in Surrey, England, was the scene of some of Bentley’s greatest racing triumphs, forging an inextricable link between the company’s motor sport heritage and this historic race circuit.